A hill town in Western Ghats, apart from its strawberries, Mahabaleshwar is also well known for its numerous rivers, magnificent cascades and majestic peaks. Mahabaleshwar is a hill station located in the Western Ghats, in Satara district of Maharashtra. Known for its captivating beauty and the beautiful strawberry farms, the city comprises of ancient temples, boarding schools, manicured and lush green dense forest, waterfalls, hills, valleys. The city is definitely among the most sought after weekend getaways from Mumbai. Charming views, enticing valleys, serene lakes and a refreshing delight for your taste buds - the best way to summarize this natures gift. Elephant's Point is famous for the beauty and peace that one gets by being there. The greenery around is worth appreciating, and nature around is stunning and gives one a sense of comfort away from the fast moving life of the city. The rock formations at the site are present in a way that forms the trunk of an elephant. It is one of the most visited and famous attractions of Mahabaleshwar which is flocked in by tourists from near and far. Elephant’s Point got its name from the age prevalent during the British Raj and the Governor of Bombay at the time, Sir Mount Elphinstone. It is believed that it was founded in the year 1930 by Dr Murray who also has an old mansion present nearby. Today, only the ruins of this hotel are present in the place of which a picnic shed for the tourists is being constructed by the local authorities. The elephant's point justifies its name and give one a picture of an elephant's head and trunk. One must surely not miss out on the place. Venna Lake is a beautiful and scenic lake in Mahabaleshwar and is frequently flocked by visitors from all over India. It is one of the most famous tourist attractions of Mahabaleshwar, and its serenity is what speaks for the place. The lake is covered with tall trees and grass all over. Venna Lake is a man-made lake and is not a natural one. It surely is one of the most eye-catching places and is a must-visit for all nature lovers out there. Venna Lake was built by Shri Appasaheb Maharaj who was the ruler of Satara and a descendant of Chhatrapati Shivaji Maharaj, in the year 1942. Appasaheb was the leader in the 19th century, and the ancient tower which is present in the centre is a mark of the history surrounding the place. The lake is spread over an area of 28 acres with a periphery of 7 to 8 km. It was initially built with the aim of catering to the water needs of the city of Mahabaleshwar. The lake has one or two thirths (place of pilgrimage) submerged to nearly 1 to 2 km. Chhatrapati Pratapsihn Garden is present on the banks of the lake. The lake offers exciting boat rides to the visitors and hence is usually very crowded. Tourists can even opt for horse rides nearby, which are mainly liked by children. People prefer to take a brisk walk to reach here from the market area and bus stand nearby. There are some eateries and restaurants nearby Venna Lake that attracts even more travellers. Pratapgad is a hill fort in Maharashtra. Situated close to the famous hill station of Mahabaleshwar in the district of Satara, the citadel rises to an elevation of about 3500 feet from the ground. Much of the fortifications are still intact, and the fort is a popular tourist destination. There are four lakes within the fort, many of which overflow during the monsoons. There is a watchtower just beside the Mahadarwaza, or the main entrance, at the end of the motorable road. There is a statue of Shivaji Maharaj in his full glory, which was installed about 60 years ago. There is a Bhawani temple at the top of the fort, and a cultural library showcasing the heritage of the fort. There is a handicrafts centre en route to Pratapgad from the base village, which draws a lot of tourists. The Lingmala Waterfall is a breathtaking and absolutely awe-inspiring waterfall that is situated on the Mahabaleshwar-Pune Road. Located just beside the forest Bungalow of Lingmala, the waterfalls provide a sense of relief and peace from the hectic work schedules and honking horns that are characteristic of the daily life, thereby becoming the perfect place for visitors to de-stress and relax. The Lingmala Waterfall also provides a view of the beautiful Dhobi Waterfall as well as Chinaman's Waterfall. The water level is nearly 500 feet from the cliff, and the falls appear ideal during the rainy season when the area is flooded with water. A trip to Mahabaleshwar and a sure shot visit to Lingmala Falls in the city is a must. The feeling that one gets on seeing water falling majestically and gracefully high up from the cliff is indescribable and the joy experienced is indeed unparalleled. The little drops of falling water appear as streaks of silver and give a rainbow effect when the sunshine falls on it. From the falls, this water further goes into the valley of Venna. The water falls below to a height of 600 feet, and the sound of water is so melodious that it feels as if it has a certain rhythm to it. The most pristine form of natural beauty can be seen here as the waterfalls are surrounded by lush greenery. The Lingmala Waterfalls are the ideal picnic spot to enjoy with family and friends because of their ecstatic location, and should not be missed by nirvana seekers, photographers and nature lovers especially. This is precisely why the place is visited by thousands of residents of Mahabaleshwar as well as tourists each year to appreciate the gorgeousness and grandeur of this site. The second highest peak in the hills is located on the old Mahabaleshwar road offering a winning view of the Venna lake & Krishna valley. The peak was renamed as Connaught after the Duke of Connaught found himself in complete awe and admiration of the area. You can also visit Elphinston point and Pandavgad. A visit to Mahabaleshwar is less or more incomplete without witnessing the tantalizing descend of the Chinaman's fall, one of the most significant falls in the state. The place is named after the Chinese prison located in the vicinity. It serves as a perfect holidaying spot enthralling a bewitching experience. These set of fascinating waterfalls connect Lodwick and Elphinston point and further join petit road with Old Mahabaleshwar road. Surrounded by greenery and rocks, these are ideal for a surreal experience amidst nature. 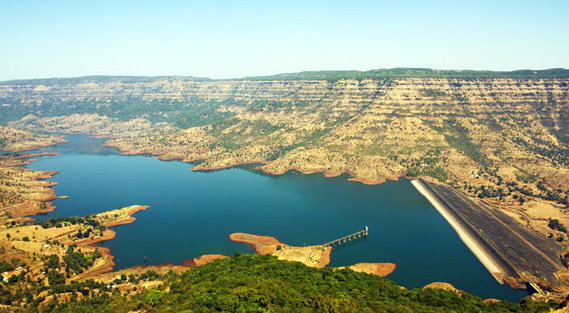 Owing its name to the five hills that surround the town, is Panchgani, less than half an hour way from Mahabaleshwar. Comprising of many exotic colonial British structures, Parsi houses, natural beauty, boarding schools, the nearby town is known for its clean and fresh air making it an ideal holiday spot for tourists looking forward to refreshing and soothing their souls. A wide plateau by the name of Wilson Point, tends to be one of the best places in the town to start your day. Catch a breathtaking view of the sunrise from any of the three watch points here. Enjoy the wide sceneries here as this also happens to be the highest points in the town. Arthur's seat or Suicide point is also known as the Queen of all points. It offers the most mesmerizing and fascinating view of the dense valleys of Brahma-Arayana and the Savitri river. The point is a huge table that stands on a natural pillar. On the way up, one can also see window point and Tiger's spring. Located at a distance of 6 km from the city of Mahabaleshwar; Mahabaleshwar temple is an ancient shrine and an ideal example of the Maratha heritage. Popularly known as the Mahabali, the temple is flocked by tourists and devotees throughout the year to bask in the serenity and tranquillity offered here. The temple is extremely popular among the Hindus, as Lord Shiva is the presiding deity here. Set up amidst the hilly terrain, this picturesque temple glorifies the Maratha Empire and its rule during the 16th century. The Mahabaleshwar temple near Satara is one of the ancient temples of Maharashtra. It was built by Chanda Rao More dynasty in the 16th century. The magnificent temple is guarded by a five feet wall and has two sections- the inner area and the outer area. The inner part, known as the sanctum sanctorum, has Shiva as the presiding deity. There are many belongings of Lord Shiva in the premises of this temple, like his bed, damru, Trishul, carvings of his sacred bull and Kalbhairav (his bodyguard); that aptly defines his presence here. The main and central attraction of this temple is the 6 feet long Shiva lingam of which only the tip is visible, depicting the stone incarnation of Lord Shiva. The Mahabaleshwar Temple has a very serene and spiritual environment. Devotees visit the temple around the year to witness the calm and peaceful aura of Lord Shiva. The site has two more temples nearby, namely the Atibaleshwar temple and the Panchganga temple. Mahabaleshwar Temple is quintessential of the authentic Hemadant architectural style of South India. Situated in the quaint valleys of Mahabaleshwar, Tapola is a satellite village where nature has been very generous. Famed as the 'Mini Kashmir', Tapola has some of the most picturesque scenic beauty which makes it an ideal destination for a back to nature experience. This destination will take you back in time when mornings were reserved for milking cows and lazy afternoons gave way to sublime evenings. There are many unknown forts in the dense forest around the lake in Tapola like Vasota and Jaygad, which make for an adventure in its own right. The scenery of these forts and forest nearby is magnificent and you can capture a bird's eye view of the entire region. When it comes to things to do, Tapola has myriad options readily available for its patrons. In addition to enjoying the serene beauty of this place, you can also indulge in a number of adventure sports in this region. Jungle treks, especially the trek to Vasota Fort is a thrilling activity and is fast gaining popularity amongst tourists. You can also explore the many nameless islands which lie in this vast 90-kilometre reservoir, or boat in Shivsagar Lake as well. In addition to this, you can also try your hand at a number of adventure sports activities that are quite famous here as well. Visit Tapola to rediscover the tranquil beauty of nature. Elphinstone Point discovered in 1830 by Dr. Murray and has an old mansion in its vicinity. The viewpoint got its name from Mount Stuart Elphinstone, the then Governor of Bombay Presidency. The mansion now lies in ruins and local authorities are planning to demolish to erect a picnic shed in its place for tourists. Elphinstone Point is one of the highest points in Mahabaleshwar overlooking the two valleys, with rivers Koyna on the left and Savitri on the right. The lofty cliff commands a panoramic view of the Pratapgarh Fort, Koyna Valley and nearby plains. One can also admire the ravine, which lies between Elphinstone Point and Arthur Seat Point. Popularly called as Blue Valley, Helen’s Point is a delight of nature. The point is popular to various everlasting sceneries, green fields, flowing waters and many such natural wonders. Most amazing will be to witness river Krishna flow through small fields. North Coat Point, Gavalani Point, Robbers Caves are some of the other must see places next to Helen’s Point. Lodwick Point which lies 5 km to the west of Mahabaleshwar is a beauty to the eyes. This vantage point provides an unmatched view of Pratapgarh Fort and Elphinstone Point. There is a huge statue of Lord Lodwick situated on the site. People flock in from different parts of the country to witness the amazing statue and to experience the view of the place. There are also some local guides present there who can guide the tourists and provide information about the area. Lodwick Point was earlier famous by the name of 'Sydney Point'. It was constructed as a means to pay respect to the first officer of the British Army to climb the mountain and reach this point, General Lodwick. To honor his brave spirit, a column was built here by his son. This column has a height of twenty-five ft and comprises of the head of Lodwick made up of marble on the base of the column. The site acts as the perfect spot to catch hold of Elphinstone Point as well as Pratapgad Fort, and since it is the only place from where one can get such an amazing view, it is visited by tourists day-in and day-out. The natural thermal spring near River Savitri, it is believed to be infused with spiritual powers. A 10 minute walk away from the Arthur's point, the shallow waters are ideal to experience and spend a solitary relaxing time amidst natures gift. Chandragad is a hill fort in Maharashtra, while Arthur Seat is a hill point in the Mahabaleshwar range of mountains. These two destinations are often visited together and they make for a thrilling trekking experience. Chandragad is a small fort. It has a Shiva linga and a small, stone Nandi bull at the top. A few water cisterns and tanks are also present. Arthur Seat point, known famously as the queen of all points, is situated at an elevation of about 4400 feet from the ground. It was named after Sir Arthur Mallet, a British officer. It offers a sumptuous view of the entire Mahabaleshwar range along with the forts of Pratapgad and Chandragad. One can choose to trek either from Chandragad to Arthur Seat point, or in the opposite direction. Bombay Point is also known as Sunset point, as tourists visit this place to see the varied shades of the setting sun. The place has a large open space, which incorporates a bandstand. This point is an ideal picnic spot and is one of the oldest vantage points in Mahabaleshwar. To the left Bombay Point, lies the lover’s point of Mahabaleshwar. Located on a hilltop, Krishnabai Temple overlooks the Krishna Valley. It was built in late 19th century by the then ruler of Ratnagiri. The temple is dedicated to Goddess Krishnabai but a Shivalinga is also found in the complex. The temple has a stone spout made in the shape of a cow's face as the source of water which is collected in a large tank. It is also believed to be the source of River Krishna. Located at the confluence of five rivers - River Krishna, Koyna, Gayatri, Savitri and Veena, the Panch Ganga Temple is a stunning ancient religious monument which was built by Singhandeo, a Yadava King in the 13th century. It has a stone waterspout called Gaumukhi from where, it is believed, that the five rivers originate. The structure, however, is an architectural treat to the eyes and draws enough tourist year on year. Mahabaleshwar is a great weekend escape after a long week at work, and your visit will be worthwhile with a trip to the Mapro Garden. Make a family outing out of it – take your child and enjoy eating all the strawberries you can out there! Mapro Garden will be the highlight of your trip to Mahabeleshwar. Situated on the Mahabaleshwar-Panchgani Road, this beautiful garden park has its own chocolate factory, a restaurant and children’s play area. Started in 1959 by Mr Kishor Vora, Mapro (the garden is named after the company) processes fresh fruits and has a processing capacity of 30,000 tonnes per year across its factories. You’ll be in for a pleasant surprise if your visit Mapro Gardens during the Easter weekend when they host their annual Strawberry Festival. Nearly 250 farmers bring in their fresh produce and offer it to the tourists absolutely free! For the adventurous kind, there are strawberry pizzas and strawberry bhels to try out! Or you can stick to the classic, succulent strawberries and wolf down yummy sandwiches. All your senses are in for a treat as you’ll get to experience the authentic Maharashtrian culture as well. Traditional dancers perform with Dhol and Lezim and regale the crowd with their energy. Enjoy the short and sweet (literally) trip which will tempt you to plan a visit again! On Wheelz is an amusement park with many thrilling themed rides suitable for every age group. They also have several exciting indoor games and a restaurant that serves mouth watering cuisine. The facilities provided at the park make it a perfect attraction for family, corporate or student group outings. One may even choose to stay overnight at a hotel nearby to make the most of the park. Babington Point is famous for the splendid view it offers of the Chinaman Waterfall and the densely covered mountain ranges. The point is 1200 metres above sea level and is a favourite amongst trekkers and nature lovers. The Koyna and Solshi Valleys can also be seen from this point. It's proximity from the marketplace make it a frequently visited point in Mahabaleshwar. Velocity Entertainmentz_is a themed amusement park. They have a number of indoor and outdoor games to suit every age group including dashing cars, gyroscope, go-carting, basketball, air hockey, zorbing, merry go round, etc. The park also has restaurants that serve Indian and Italian cuisine. It is a perfect attraction for picnics and outings. Once a summer retreat of the British, Marjorie Point is a sightseeing point that offers a stunning view of the Sahyadri Mountain Range in the Western Ghats and the beautiful Konkan Valley. The attraction is, therefore, a treat to nature lovers, photographers and trekkers who can trek up to the point through the thrilling trails that run all through the dense forests. Table Land, with an elevation of 4,550 ft above sea level, is the highest point in Panchgani. Credited as Asia’s second longest mountain plateau, it is a vast expanse of flat laterite rock surrounded by hills. The 95 acres area of the attraction is beautifully carpeted with the tiny blue bonnet and star, along with other grasses that grow in the month of August and September. Apart from shielding the destination from strong winds and heavy rains, the place also offers an aerial view of the entire town and the valleys located nearby. The place also contains several avenues of entertainment like horse riding, merry go rounds, mini trains, food stalls and a couple of games counters. Owing to is elevation, the place also offers an aerial view of the Rajpuri Caves and Devil’s Kitchen. Roman Catholic Church is an 18th century church built for British citizens who settled in India. It the only Roman Catholic Church in Mahabaleshwar. The Church has stunning stained class windows and beautiful paintings. The Colonial era architecture has quite a pleasant vibe and is a treat to the eyes.